Click the button below to add the BALT Eurostyle Elastic Band Chair  to your wish list. Contemporary and edgy, the BALT Eurostyle Elastic Band Chair features a series of elastic bands in lieu of a traditional padded or mesh back. The unusual feature conforms to your body's shape for the ultimate sitting experience. Along with the unusual back, the elastic band chair also includes more traditional features of other BALT chairs like a pneumatic seat-height adjustment and a wheeled base. The Eurostyle band chair supports up to 350 pounds and is made of lightweight plastic materials. 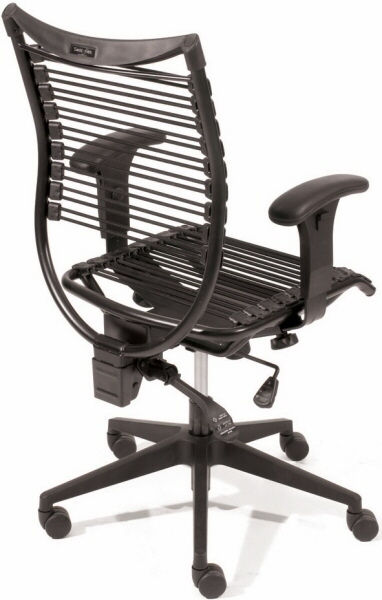 Order the elastic band office chair today and get fast and fast shipping to the contiguous 48 states.